Your chance to win a mass fidelity core wireless loudspeaker worth �479. Jon Myles loves the sound of the new flagship loudspeaker in Spendor's classic range. A small loudspeaker that sounds much bigger than it looks. Jon Myles and Noel Keywood are impressed. The latest B&W Zeppelin combines iconic looks with wireless connectivity. Jon Myles takes a listen. Noel Keywood puts FiiO's new budget portable through its paces. Acoustic Research is back - with a new combined USB DAC and headphone amplifier. Jon Myles reveals all. Martin Pipe listens in to a low-powered, single-ended integrated valve amplifier from Italy. Martin pipe on a design classic that still has much to offer. Here's a rare beast - an eminently readable book on designing power amplifiers. Noel Keywood gives his in-depth view. Noel Keywood brings you all the news from this year's Sound & Vision show in Bristol. Handing out the coveted Hi-Fi World Awards globes at our annual ceremony. Jon Myles reports from the evening. Join martin pipe as he tracks down the bargains at the latest Audiojumble fair in Kent. 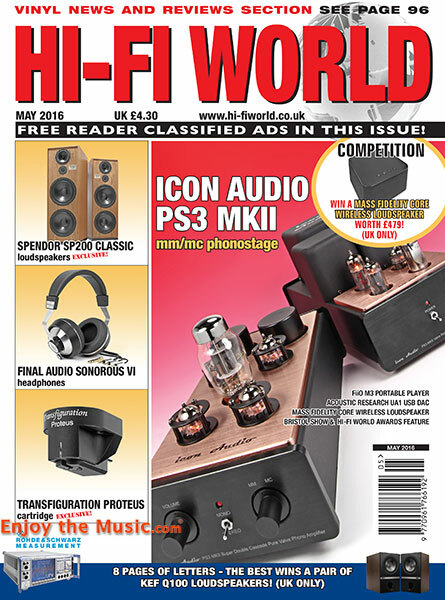 Noel Keywood extols the virtues of a valve-based phonostage that sounds like few others. 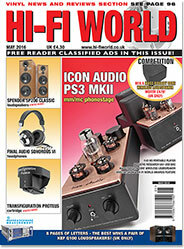 Paul Rigby tries out the latest moving coil cartridge from transfiguration. Deadbase50 - a comprehensive look at the Grateful Dead's vinyl and live legacy captivates Paul Rigby. A new name in in-ear monitors - but one that offers something different, says Jon Myles. Final audio design's latest mid-priced headphones appeal to Jon Myles. Paul Rigby looks back at Phil Collins' Face Value.